Saturday 27th July 2019: 12pm - 11pm . Children 4 and under go free, but will still require a ticket for entry to the festival site. £50 deposit for 1 Glamping Tent for 2 people, (1 deposit only needed per tent), Early Bird price £895. You will be contacted by the Smoked & Uncut team once you have purchased your deposit to take payment for the remaining £845. 3 course sit down feasting lunch in The Field Kitchen tent hosted by Angela Hartnett PLEASE NOTE: FESTIVAL ENTRANCE TICKET NOT INCLUDED, ENTANCE TICKET MUST BE PURCHASED SEPARATLEY. The feasting tent is on-site in the festival grounds. You will not be able to enter the festival grounds without a Standard Admission Ticket. This bolt-on ticket is only available to those who have purchased a Standard Admission Ticket. 3 course sit down canteen-style curry feast with either a can of lager or glass of wine. PLEASE NOTE: FESTIVAL ENTRANCE TICKET NOT INCLUDED, ENTANCE TICKET MUST BE PURCHASED SEPARATLEY. The feasting tent is on-site in the festival grounds. You will not be able to enter the festival grounds without a Standard Admission Ticket. This bolt-on ticket is only available to those who have purchased a Standard Admission Ticket. 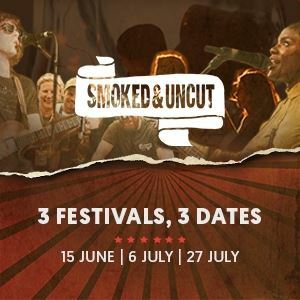 Smoked & Uncut 2019 will see 3 festival dates held over June and July, across THE PIG and Lime Wood hotels and set to an eclectic soundtrack, from folk to funk and rock'n'roll to reggae. Jump in feet first to our line-up of open-air parties; intimate home-grown festivals, not too far from home, that are just as much a celebration of food as they are music. All festival attendees require a festival admission ticket to enter the festival site. Children 4 and under go free, but will still require a ticket for entry to the festival site. We have a very limited number of Early Bird Admission tickets available for each festival, these are subject to availability and once they have sold out Standard Admission Tickets will be released. There will be food stalls and bars on site, so we kindly ask that people do NOT bring their own food and drink for the day, all items must be purchased on site.